As part of the NEW Friends of the Forum Membership Community site, which will serve as an unparalleled resource for connectivity for Florida's entrepreneurial and funding communities, we have streamlined efficient new membership opportunities that provide incredible benefits to you and your organization. View all the benefits below to decide which level of membership works best for you! Company listing, logo and description on “Friends of the Forum” Membership Site. Opportunity to distribute news announcements. Opportunity to list your organization’s events on the Forum’s online calendar. One executive summary upload for presenter consideration. 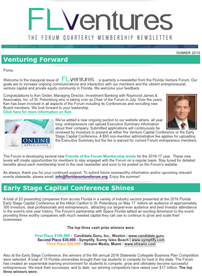 Subscription to “FLVentures” quarterly member email newsletter. Discounted member registration rate at Forum and participating partner events. Co-Marketing Opportunities at Forum Events. Free access to Forum Member events (non-conference). Opportunity to coach companies presenting at Forum conferences. Opportunity to serve as panelist or moderator at Forum events. (one per year, must be approved by the Forum). Member to member communication with Forum entrepreneurs. a sustaining level with some board engagement. This is an invitation only member level. Company listing, logo and description on the "Friends of the Forum"
One seat on the Forum’s exclusive, invitation-only Advisory Board. 1 Venture Capital Conference ticket (non-transferable). 1 Early Stage Attendee ticket (non-transferable). Recognition in scrolling PowerPoint displayed at Forum Conferences. Company logo on the Forum website homepage. Opportunity to serve as a panelist or moderator at Forum events and programs. Opportunity to co-host Forum networking events. Networking opportunities with the Forum Board of Directors. (based on approval by committee chair). (based on approval by Selection Committee). COMPLIMENTARY ACCESS to Forum Member events (non-conference).